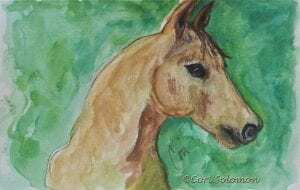 This painting of Doodles a Quarter Horse that I encountered while I was wine tasting in Santa Ynez Valley is created using watercolor pencil. I was experimenting with using a new medium that I could work with easily while recuperating from surgery. This artwork come matted. To purchase this horse Painting email Cori.